Visit MacRumors.com for the latest news/rumors. | Got Mac News/Rumors? Submit It. 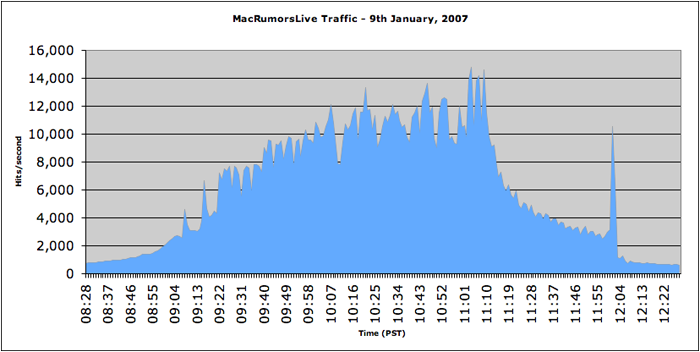 On January 9th, 2007, MacRumors.com successfully delivered live updates of the Macworld San Francisco keynote speech to over 213,000 people simultaneously using the latest web technologies. "I managed to catch most of [the keynote] near-live via MacRumorslive.com which provided a great example of how to report an event near-live. It had me hooked to the point where Flo got much longer to play in the bath than usual whilst I checked out every photo. A very simple interface with a count-down in seconds to the next update made the theatre all the more exciting." Since February 2000, MacRumors.com has closely followed news and rumors surrounding Apple Computer. Public interest peaks every year at Macworld San Francisco when Apple typically announces its new products. This year's event was highly anticipated due to the possibility that Apple may announce the long-rumored iPhone. Each year, MacRumors.com provides live web and IRC updates of the Macworld keynote speech. In 2006 we successfully webcast 4 events using an AJAX-based web update system called MacRumorsLive, designed to handle the increasing interest in Apple's keynote address. The setup was created to offer unlimited scalability and tailored to provide live text updates to a large audience of people. This is accomplished by using the latest web technologies (AJAX) to minimize the amount of data that needs to be sent to each individual viewer. Last year we decided that the addition of near-live photographs taken during the event would be the next logical step for MacRumorsLive. Planning for this addition started almost as soon as the WWDC keynote had ended and took several months, solving the major challenges involved in serving photographs to such a large audience. Amazon's EC2 service provided a vital role in the MacRumorsLive system, providing almost instantly available additional capacity. The service allows the creation of flexible virtual servers with capacity far beyond what could be provisioned using normal dedicated servers. For this keynote EC2 provided additional capacity for both MacRumorsLive and the MacRumors forums. Amazon kindly provided us with capacity beyond that normally allowed by the beta service. Cachefly's CDN served almost all of the static content during the keynote, at times handling almost 10,000 hits/second. Amazon's S3 provided a backup CDN and additional capacity. On January 9th 2007 the keynote day arrived and the final testing for MacRumorsLive was complete. Even with the experience of previous events, the traffic the keynote attracted exceeded all our projections. We peaked at approximately 213,000 simultaneous web visitors during the keynote speech and transmitted over 408 GB of data. If not for the efficiency of the MacRumorsLive AJAX update system, the same webcast would have had to transfer almost 1 terabyte of data. The following statistics are based on a 24-hour period, however approximately 95% of traffic occurred in a 5 hour window surrounding the keynote speech. Hits per second from 8:28am to 12:28pm. Average over each minute. The final Macworld keynote speech transcription is archived here (click). The live update page polled our servers every 60 seconds to receive the most recent updates. Delivering live updates to over 200,000 individuals simultaneously was an enormous task both logistically and technologically. We at MacRumors.com are ecstatic with the success of our efforts and plan to provide ongoing coverage for future live Apple events. Our MacRumorsLive system will continue to be tweaked and improved. Thanks to all the visitors and participants who made this possible. MacRumors.com represents one of the largest Mac communities on the web and will continue to provide timely updates and lively discussions on Apple's current and future plans. The MacRumorsLive AJAX system was created by Scotland-based developer Equiknox for MacRumors.com. The system may be adapted to broadcast other live events. If you have an event that may benefit from a reliable, fully managed, webcast please contact us. To contact MacRumors.com please visit our Contact Us page. Calculated as average over each minute. An estimate of the data that would have been transferred had a meta refresh page with a 60 second refresh been used. This does not include any additional content such as images or CSS, which although in theory would be cached, in practice would add considerably to this figure. Covers period 9:14am - 11:12am.